The anatomy of the hand is complex, intricate, and fascinating. Its integrity is absolutely essential for our everyday functional living. Our hands may be affected by many disorders, most commonly traumatic injury. For any physician or therapist treating hand problems, the mastery of such anatomy is fundamental in order to provide the best quality of care. Many forms of arthritis and related conditions that affect the joints, muscles and/or bones can cause problems like pain, stiffness and swelling in the wrist and fingers. Other conditions can cause additional problems, such as numbness and tingling, pitted nails, painful ulcers or thickened skin that makes bending the fingers difficult. Here are some possible disease-related problems that affect the hands and wrists. What Causes Common Hand Injuries? Hand pain can be caused by disease or injury affecting any of the structures in the hand, including the bones, muscles, joints, tendons, blood vessels, or connective tissues. 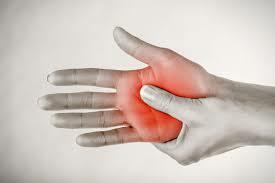 Hand pain is one feature of joint inflammation (arthritis) that may be felt in the hand. Rheumatoid arthritis and osteoarthritis are the two most common types of arthritis in the hand. Repetitive motion injuries, including carpal tunnel syndrome, can cause pain in the wrist and hand. Tumors of the structures in the hand are a very rare cause of hand or finger pain. Certain conditions such as diabetes can cause damage to the nerves, resulting in pain, numbness, or tingling of the arms and legs. This phenomenon, known as peripheral neuropathy, can also sometimes cause hand pain. DeQuervain’s disease is a swelling and inflammation of the tendon around the thumb, causing pain in the thumb and lower arm. Trauma or injury to any of the structures in the hand is another common cause of hand pain.